International Checkers plays largely the same as Standard Checkers/Draughts, except that it is played on a larger board (10x10, or 100 squares, vs. 8x8, or 64 squares) and uses more chessmen (20 for each player vs. 12). A single checker may only move one space forward, in a diagonal direction, to an unoccupied square (this is the same as Standard Checkers), but may jump an opponent's man, either forward or back (this is different than in Standard Checkers). If you have more than one possible move that would capture your opponent's pieces, you must choose the path that will capture the most checkers. In a move known as "flying kings", kings can move more than one space along unblocked diagonals. If a checker lands in the opponent's last row by means of a jump, it is only crowned as a king if no other moves are available to it. If more jumps are possible, then it must take them, and it will not be kinged. A checker is not kinged unless it finishes a move in the opponent's king row. 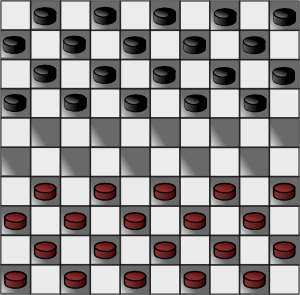 Captured checkers are not removed from the board until all jumps on that move are completed. The bigger board, larger number of players, and minor rule differences make International Checkers a more strategic (and some would say, more interesting) game than Standard Checkers. International Draughts is thought to be the most popular form of the game worldwide. A Dutch-language site that provides hundreds of links to International Draughts information on the web. A Dutch-language site for International (10x10) Draughts. Dragon Draughts is Windows software for playing international (10x10) draughts, with 15+ different playing levels, from beginner to master level. Shareware. ItsYourTurn.com provides these rules for International checkers. They also provide rules for American Checkers. Learn about International Draughts from the free online encyclopedia.